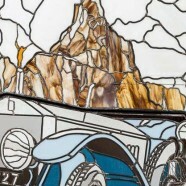 2013 marks the centenary of James Radley’s victory in the Alpine Trial with his 40/50 Ghost – to celebrate this I have designed and built a twenty square foot leaded glass panel of his motorcar. This is the second large scale automotive project I have undertaken; the first featured a 1902 Panhard et Levassor and in the last year this has been well travelled having been exhibited at the headquarters of the Veteran Car Club, Cranfield’s History of Motorsport Conference and most recently at the Grand Hotel in Brighton for the Veteran Car Club’s London to Brighton Run dinner. Whatever you need, whether it's a new stained glass panel or restoring a broken or damaged stained glass window Ketton Stained Glass are your local stained glass specialists.